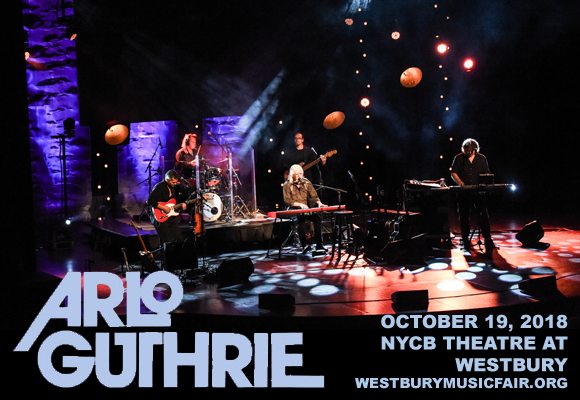 Son of world-famous folk singer Woody Guthrie, Arlo Guthrie is a legendary folk singer in his own right. The "Alice's Restaurant Massacree" singer comes to NYCB Theatre at Westbury on Friday 19th October 2018 for a night of satirical folk songs from a veteran performer who has been entertaining audiences for over five decades! This year marks the 50th anniversary of his beloved Thanksgiving classic, so get ready to sing along! American folk singer-songwriter Arlo Guthrie, son of famous folk artist Woody Guthrie, began his career in 1967 with the release of “Alice's Restaurant Massacree” – an 18 minute satirical talking blues song based on real life events that went on to become his most famous record. A storytelling protest song that references the Vietnam War, “Alice's Restaurant…” became a Thanksgiving anthem for many and served as a symbol of the late 1960s, defining the counterculture of the time. It also earned Guthrie his first recording contract, and a recording of the track became one side of his debut album, Alice's Restaurant. Guthrie also had a Top 40 hit with a cover of Steve Goodman's "City of New Orleans", and minor hits with the songs "Coming into Los Angeles", “The Motorcycle Song” and “Gypsy Davy”.